Jens Heitjohann: Can you give a short introduction to the project Sounds from dangerous places? What is the idea of the project, which places do you visit and why? In a second step I would be interested in the relationship between the traveling and the presentation of the results of your research. Peter Cusack: Well, the idea came accidentally. 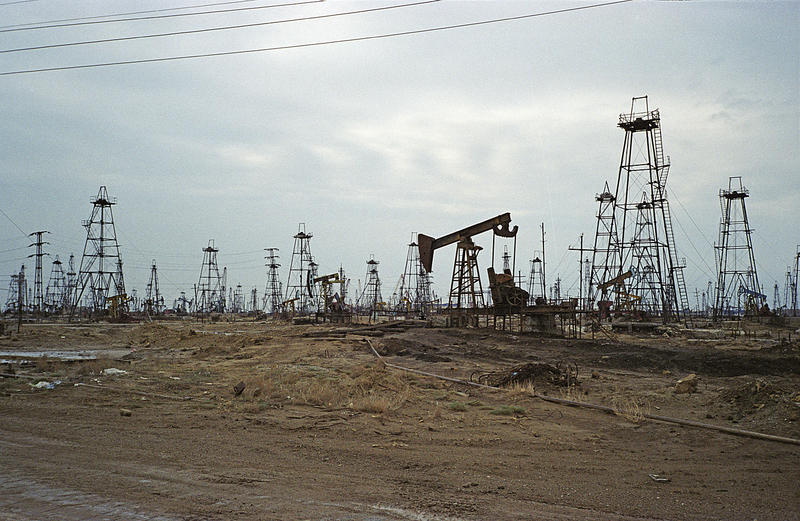 I was traveling in Azerbaijan in 2004 and I visited an oil field. Azerbaijan is the center of the Caspian oil industry. I had never been to such a place before and it sounded amazing. It was also visually stunning. These are old oil fields, which started in the 1860’s, 1870’s. For most of their life they have been part of the Soviet Union’s oil industry. And much of the technology is from that period. Some of it is years old and has broken down. The sound is created by the pumps that still work; there are many but they show their age – each has a different squeak, a different groan, and a different hum. If you walk around, you move from one pitch to another, and through a sequence of repetitive rhythms. It’s an incredibly musical sounding place. And to somebody like me that is very attractive. Visually it’s a desert area, beside the sea, the sky is blue, the soil is yellow, but it’s saturated in oil and very polluted. Everywhere there is oil, pools have oil on them, which makes them brilliantly reflective, like mirrors, and it smells of oil all the time. But it’s visually very spectacular. So, initially I was very impressed by this place for aesthetic reasons, but after being there for a while, I noticed other things. There were people fishing, there were nets in the water and the fish pulled out were covered in oil. There were other people with a herd of cows. The animals had nothing to eat, except a few blades of grass, also covered in oil. These people were forced to eat this very unhealthy food and live in a very unhealthy environment. They were marginalized gypsy people who just couldn’t find anywhere else to live. They’d been thrown off any other place. So, that immediately raised other issues, namely the politics, culture, sociology and economics of the place, which were a complete contrast to the aesthetics. That’s where the idea of sounds from dangerous places came from. For the people who live there, and for its geopolitical impact, it is a dangerous place. Whereas for me it was an aesthetically amazing place. There is a big contrast between the two points of view. I thought about it a lot, and started asking if there are other places in the world, where changes to the landscape, or economic/political developments, have effected the soundscape in a similar way. I asked about other environmentally damaged places – dangerous places in this project eventually became defined as places of major environmental damage. Obviously I thought about Tchernobyl and the exclusion zone that has existed since the nuclear accident. What had happened to the soundscape there? Other examples are big dams built in major river systems. They create environmental changes in the areas concerned and displace many people. Sometimes thousands, hundreds of thousands, are forced to move. I visited dam projects in southeast Turkey, which is also dangerous because it’s a war zone. There’s regular fighting between Kurdish guerillas and the Turkish army. Then I started thinking; well it’s nice to travel, but what about my home, in the U.K.? There I visited the edges of military bases, nuclear sites (mostly nuclear power stations), plus waste – big landfill dumps. Those were the kind of environmental areas I wanted to record, to discover what relationships there might be between environmental change and the soundscape. For me, sound became a way of studying areas of environmental change in addition to the other methods that could be employed such as science, journalism or visual explorations. So it is not as if sound is the only change, of course it is not. Subsequently I became interested in how sonic changes related to visual, anecdotal or even scientific changes in the same area. Although I began with sound over time I’ve became interested in other types of recording, like photography, writing or scientific investigation. Now all of those things interest me within this project. JH: What about the presentation of the material, do all these different media play a role? PC: Yes, I quickly discovered that there was no easy way of presenting this material, because it is so complex and many-layered. If you produce a CD for example, you deal with audio and (possibly) a booklet that goes with the CD. If you make a radio program, you can present only sound. With an installation, sound and visual information are possible. And if you give a talk, you use language plus sound and visual projection. Each of those has advantages and disadvantages. I like to use the same material but in many different ways. Over time you are able to tell a story, but I don’t think there is just one way of presenting it. You must do what is practical given different circumstances. JH: As you mentioned you have changed your strategy to record the sounds of places. Can you describe this change? And secondly, how do you see yourself and your position in these places as a recordist? PC: Yes, I describe myself as a field recordist. Sometimes these recordings are used for art projects, but other times for education or talks. So, it’s not always art, that comes out of it and that’s fine with me. I have changed my approach a bit. At first, when the whole thing was new, I didn’t really know what was possible. 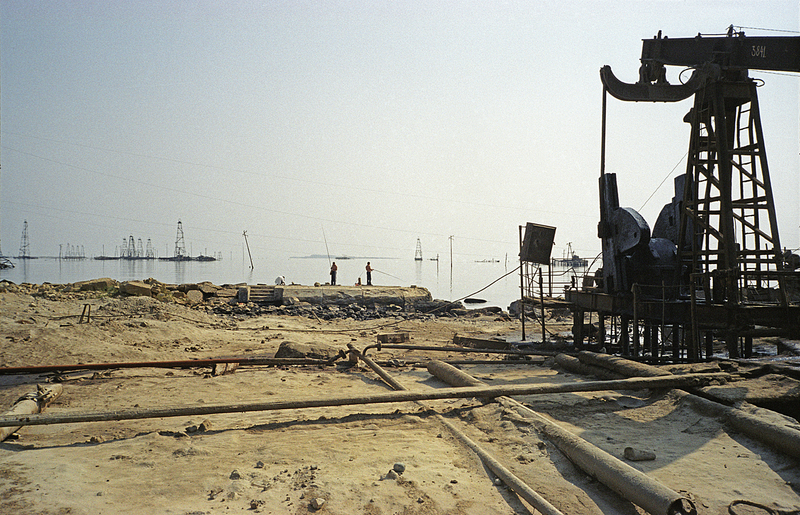 In the oil fields, for example I only made recordings and took a few photographs as an after thought. But now, I try to find people to talk to, to do interviews and to take photographs as well as the sound recordings. But I also do more research, for example in Tchernobyl you need to know a little bit about the science of nuclear power and what happens in a nuclear explosion. More recently, I started to call this approach sonic journalism because I think it gives you a sonic perspective on stories that many journalists would cover but from their own points of view. If you lead with your ears, you get a different angle from people who are more visually or language orientated. I don’t think that any of those is any better. In fact, having them together gives you a fuller picture. It’s just that I am a sound orientated person and my first sense is hearing. I hear sounds and then ask questions about them. Why is that sound there, what is it? What does it tell you – if anything. I did a project on the estuary of the river Thames in the U.K., at a holiday resort called Southend. If you go there and record, you often hear deep drones in the distance. Before I went there I didn’t know this and afterwards I wanted to find out what they were. In fact it is shipping. Big ships that come up the river Thames make these deep drones. The soundscape of Southend often has the underlying, quite powerful sound, of passing ships. I had been invited to do a project there and, because of the sounds, decided on shipping as the subject. It turns out that a huge new port is being built just up-river from Southend. It will be the largest in the U.K., with the most up-to-date technology and is expected to open in 2013. It’s designed to take the largest container ships, which have a draft of maybe 14, 15 meters. But the Thames at low tide is only eleven meters. So, in order to make the port, they must dredge the river to make it deeper. And it is not just the river. Dredging is necessary out into the North Sea. It is a huge operation that has massive environmental consequences under water. The local fishing industry will be affected, the shorelines of the Thames will be affected, and so will wildlife above and below water. The port will also destroy tidal marshes that are valuable for birds. It’s been very controversial in the local area. The multinational company building the port, of course, knows this. They recognize the issues and have made agreements with local fishermen to compensate them. They’re building new marshes for birds to replace those lost. All that, in my opinion, is just window dressing. Complex ecologies are very difficult to replace and anyway underwater we will never really know what’s going on. The fishermen may know but one of the clauses in their compensation agreement is that they are no longer allowed to talk about it. In the end I pieced together as much as I could and found out quite a lot about how big developers deal with environmental concerns. In fact the final project partly focused on environmental public relations. One of my ideas was to try to record the sounds of dredging, because I thought that would be quite a good way of presenting what it might be like underwater. But, in order to do that you have to find the ship that is dredging and that proved to be impossible. The company wouldn’t say, the fishermen are not allowed to say, and nobody else really knew. So I was forced to just look for a long time and observe. I made many recordings of underwater shipping, but I never found the dredger. But I discovered a lot of other things instead, such as how to track ships on the internet and how globalised these developments are. All very interesting. JH: So will this be a part of Sounds from dangerous places or will it stay on its own? PC: No. Sounds from dangerous places is going to change. I will do several projects concerning water issues, under the title, Sounds of water use and abuse. The Turkish dams project and the Thames project will be included. And I am hoping to go to a couple of other places where water questions are important. One is close to Southend again, where an island is being flooded to re-create the original saltmarsh habitat. It is partly as a wildlife reserve and partly as a natural defense against rising sea levels. I don’t want to cover only negative things. This would be a positive story. JH: As you already mentioned, dealing with sounds also touches questions of representation. Are the sounds able to represent something that you call dangerous or many people call dangerous like Tchernobyl, for example? Of course it is common sense, that this is a really dangerous place up to today and will be for thousands of years. But in the recordings this dangerousness is not obvious – you cannot hear it directly. In this context I would like to talk about the relationship between the words you add or some other material, like the photographs, and the sounds you present in your lectures. When seeing Sounds from dangerous places in Berlin, I recognized that there weren’t many photos nearly up to the end. For example from the Caspian oil field, there was a lot of sound presentation and you were talking about it and only in the end you showed some photographs of the places. I was really impressed how strong the images were that I had imagined before seeing the pictures. How would you describe the relationship between the representation of the dangerousness in the sounds and the talking about it? PC: Well, the talking is important, because it’s through language that you can contextualize both the sounds and photographs. When listening you may not hear the dangerousness. But it depends what it is. Sometimes the sounds are quite sinister. But usually you need some more information, to really understand what the sounds are. Sound is very good in creating an atmosphere and at encouraging your imagination to suggest its own images. That’s why I don’t show the sounds and the images together. I show them one after another. By the time you see the images, you have got your own imaginary images from the sound. I think the contrast between your imaginary images and the real ones seen later is a strong force in making it more memorable. So I deliberately don’t have the sounds and the images at the same time. But the text is also important because it gives factual information that you don’t hear in the sound recording. For me they’ve all got to work together, but they’ve got to work in such a way that they reinforce each other and sometimes clash, because it’s the contrast that is interesting. For example Tchernobyl has become a wildlife haven, a major wildlife area. If you go in springtime, you can record fantastic dawn and evening choruses. On listening the sound is very vibrant, very loud. It sounds like an area that is incredibly healthy. And then you find out that it’s the Tchernobyl exclusion zone. This might raise a few questions, such as, “This is supposedly one of the most radioactive spots in the world. How come wildlife is doing fine?” You might ask too, “Well if wildlife is fine, why aren’t humans doing so well?” None of these issues are simple. They’re all extremely complex, but we have a tendency to deal with them in a very simplistic way, like: Tchernobyl – oh, really bad – can’t go there – terrible for thousand years. Well, actually no. It’s pretty good for wildlife and there are thousands of humans living or working there right now. The issues are not straightforward. Even after a nuclear blowout life goes on. Another question might be, “Why is it that wildlife in the exclusion zone is doing so well?” It has nothing to do with radioactivity but with the fact that humans are no longer getting in their way. They are no longer shooting them, or destroying their habitat or interfering with their lives. It shows the regenerative powers that nature possesses. For me that observation raised the whole question of our relationship with other species irrespective of whether it was Tchernobyl or not. And there was more in Tchernobyl to emphasise that. I was introduced to people who still live in the exclusion zone villages. Whose families have been there for generations. They are the traditional people of the area and still value their local folklore. They know the songs, their culture and local farming practices, which are very dependent on a deep knowledge of the local environment. I met one woman, for example, who was evacuated after the Tchernobyl explosion but didn’t like the new place, so she went back and lived in her old village again. Her response to the nuclear accident was to start writing poetry. She composes them in her head and remembers them, rather than writing them down. The poems often speak of how wildlife and humans were pulled apart by the evacuation. Birds fly over, look down and see an empty village. They ask, “Where are the people, where should we look for you"? Or there is a sad conversation between trees: “My fruit has ripened and fallen. It was beautiful, but is now rotting on the ground. Where are the people that enjoy my fruit?” They speak of a relationship with land that is completely interdependent; the trees and animals need the people as much as the people need animals and trees. It’s quite different from the green culture that we have in our own politics, which has a far more conceptual relationship with the environment and is much less practically based. That to me was very interesting and I found out about it by following the sound. I heard that these people still sang. So I asked if it might be possible to record some songs, and when we visited the villages, there was a great deal more to learn as well. That is one example of following a sonic perspective. JH: So the focus on the sound is first of all your artistic research strategy and the result is a different perspective, a different mode of representation of these places. What you describe had a lot to do with finding a different kind of description or a different strategy of mapping a place. Can you relate this a bit to other works you have done? For example the Favourite Sounds Project, which was, as I understand it, a work on exploring the city in a different way. Is it a new development or is it more a variation? PC: It is a parallel development. Although I believe that the Favourite Sounds projects and sonic journalism projects have moved closer together over time. The Favourite Sounds project has been running for twelve years and has happened in some very different places. I am beginning to realize that the recordings made for that project also have journalistic aspects. A very good example is in Prague where I was able to record the sounds inside rails as a train runs over them. To do this I had to get close to the railway, attach a contact-mic to a rail, wire it to the recorder and wait there as trains went past. In the Czech Republic nobody seemed to mind. If I had done this in the U.K., I would have immediately been arrested as a possible terrorist. So that experience highlighted the difference in levels of security paranoia in the Czech Republic and the U.K. I have since become more interested in security paranoia. I must say that Germany seems much freer of it than the U.K. Last November I went to the huge open cast mine (brown coal) at Garzweiler, near Düsseldorf. It’s quite possible to walk right to the edge of the mine to photograph and record and again there was no security. In the U.K. it would be surrounded by fences, cameras and maybe dogs patrolling. Getting close would be a big problem. Such experiences actually tell you quite a lot about the differences between countries and places. And I’m just starting to realize that this kind of information does come from the Favourite Sounds project. Berlin is a much quieter city than London, so what you hear is less traffic and far fewer airplanes in the sky – except in Pankow and Wedding where the planes come in to Tegel and even that will stop this June. You hear more children playing. That again is an interesting observation. One of the other things the U.K. is now paranoiac about is children playing on their own in the street. When I grew up I used to play in the streets all the time with my friends, now it almost never happens. However in Berlin one hears it quite a lot. That tells you something about the differences in the attitudes and fears concerning children in Berlin and London. It is a glimpse into social and cultural differences between places through the sounds that you hear. But it has taken me years to realize that. There are other comparisons too. You hear many more church bells in Berlin for example. There was a time when you heard mosques in London, but after the London bombings hardly at all anymore. However I do have recordings of London mosques from before that. But I’ve never even seen a mosque in Berlin. Where are they? They must be here somewhere. So you begin to notice social, economic and cultural difference through difference in the soundscape. That brings the Favourite Sounds projects now a little bit closer to the Dangerous Sounds projects. There are still big differences but I can see more similarities than I previously believed. JH: In the Favourite Sounds project you are working with the Google maps interface. We can zoom in and activate a sound that is attached to a place, represented in the map. This, I would say, has absolutely changed the idea of what a map could be. PC: Yes, but the idea of the sound is also changed by being able to see the map – it works in both directions. JH: Have you had ideas of working with maps, in the Dangerous Sounds project as well? For example in South East Turkey, in Kurdistan? PC: Yes, I have. In fact I plan to do that. There is a lot more to be done with the favouritesounds.org map, but unfortunately I am not a programmer, so I have to wait until I can find some money to pay somebody to do it. The ideas are a lot further forward than the practice. One thing that the current map does have is linked sounds. I haven’t used it so much – but there are some nice examples from Birmingham. Birmingham is a huge immigration area in the U.K. There are many people there from all over the world. So instead of just considering Birmingham, I asked people about sounds that they remember from their countries of origin. Of course it was impossible to go to those countries to record, so people talked about sounds in words. I don’t know whether you want to call that an extended field recording – it is a verbal description of a soundscape. To give an example of one 19 year old from the West Indian community. He was born and has grown up in Birmingham, but his family originates from Jamaica and he has been there twice in his life. In the recording he describes the sounds that he heard on one Jamaican trip. He is a very articulate guy and speaks beautifully. In some ways his description is better than having a sound, because he talks in such a way that you can imagine the sounds very easily. As he speaks the map positions jump from Birmingham to Jamaica and back again. And you see satellite images of the places that he is talking about. It is very evocative. And also from Birmingham, there is a similar example when a Bangladeshi speaks about the sounds of his home village in Bangladesh. In Berlin I would like to do interview with some of the immigrants here concerning their soundscape memories. JH: Do you follow other ideas of presenting these things besides the maps? For example for the Prague Project the outcome was something like a radio play or even more a musical composition. PC: Yes, that was more of a musical composition. The reason for that is because I was collaborating with Miloš (Vojtěchovský, JH) and other Prague artists, and in discussion that was the way things went. But there is also a website where the original recordings can be heard and you will find some sounds from the Prague project on favouritesounds.org map and also at http://panto-graph.net/favouritesounds/index.php. As I said before, I think it really important not to have only one way of doing these projects. It is only through a succession of different approaches that you get a bigger picture. Sometimes I’ve used some of the recordings in improvised music where they get changed and covered up. It is more of a private thing, but it does happen. JH: Do these influence each other? Your practice as musician and as a sound artist? PC: I think it is no accident that I am interested in improvisation and in field recording. On the surface there seem few similarities, but in practice I believe there are some significant ones. When field recording you have to record what is there, you can’t predict or chose what is going to happen, you just have to make the best of what’s going on. Often when I go out with the intention to record a particular sound it just doesn’t happen. However it is likely that something else entirely unexpected will occur instead. And improvising is similar. It is unpredictable, not planned. You have to react quickly to what the other musicians are playing. Likewise with recording, you must react rapidly to sonic events as they happen. Also both accurate and sensitive listening is very important. You may have to pay attention to several things going on at the same time. I think the process of field recording and the process of playing improvised music are not nearly as far apart as might appear. JH: So you are an improvisational musician with the microphone. PC: Yes, you could say that. I mean, that is me. Other field recordist will probably tell you something quite different. But I would say for myself, my experience as a musician is very much a part of the way I record.